William of Mass Destruction: If Izzy Could Tweet. Nope, not scary at all!!!! However, we have NO decorations up! Yeah, moms.... what can we say? Looks like it would be fun to bat around though! WE don't have any decorations up either. Mom is a Halloween "who cares" mom. Moms are so easily impressed and scared--silly creatures! I think it's kind of cute. 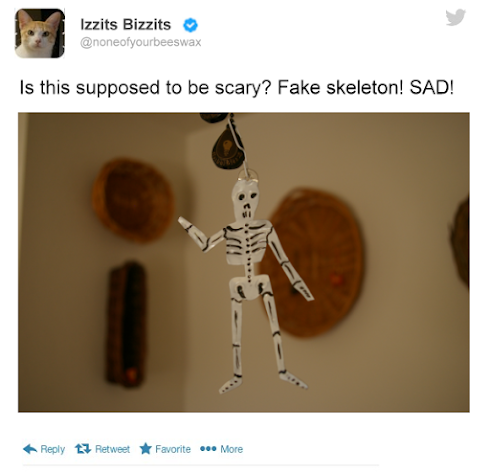 It should be REAL BONES! With some meat left on. Like a beef rib or ham bone. MOL! Yeah, that skeleton really is SAD! Izzy, I am on Twitter but don't do much there...but I'd follow your tweets!